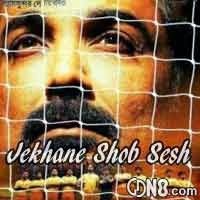 Jekhane Shob Sesh Song Lyrics From Bengali Movie Lorai (2014). A beautiful Song Sung By Timir Biswas. Music composed by Indraadip Dasgupta. This Movie Directed by Parambrata Chatterjee. Starring: Prosenjit Chatterjee, Gargi Roy Chowdhury, Indrasish Roy, Payel Sarkar And Others. Oo..Chole jawa sohoj to noy tobu chole jaai..
Phire asa sohoj to noy, phire aste chai..
Ho.. jaa kichu haralo jaane ta oshomoy..
Station chere gele ichhe-ra dur mone hoy..
Oo. shomoy niye elo ke jane ei kothay..
Jhor ke mene nile sunechi raat kete jaay..